Alan Bonnici and a few good mates headed up to Wurdi Buloc in search of Trout. The conditions were a very cold 3 degrees which didn’t stop the guys getting into their waders and casting a range of lures and spoons. The session at first was without any luck with Mark Moseley dropping a very nice size Trout right as he was about to net it and Alan to dropped a nice size Trout in similar conditions. 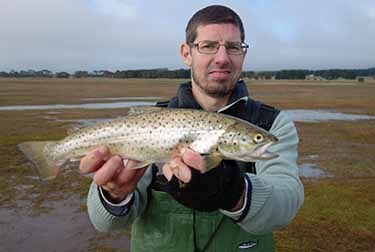 The guys however would manage a couple including this lovely 47cm Brown Trout which was caught on a golden Nories Wasaby.